Welcome to Lowered Expectations, week 17 edition! Each week, we go about posting chalkboards and GIFs of the weekend’s best open-play shot attempts which did not quite live up to expectations (and rarely do we update this paragraph). We look at each one and not only evaluate the results, but also the process leading to them. This is quintessential Montreal Impact at it’s best. A turnover to long pass leading to a fast break after solid bit of hold up play from Matteo Mancosu which then leads to a hasty shot. I honestly think Alejandro Silva has just the slightest bit of time to bring the ball down, perhaps not settle it, but at least bring into a better shooting position prior to trying to create the shot attempt. The value of the attempt seems diminished because of the touch, and even to an extent, wasted due to trying to be overly clever. Last quick thought: don’t sleep on this pass by Saphir Taïder. It’s not necessarily great, but it’s exactly where it needs to be to split the defense and still be within Mancosu’s reach to control and push forward. The touch by Gerso Fernandes is pretty painful to watch. But if you need some salve just look how cool and calm Johnny Russell is in starting this counter. He intercepts a terrible cross (which... why was that even passed???) and instead of charging forward he sees runners in front of him and picks out a simple pass going forward. This seems like a small thing, but if he takes it forward Houston has a much better chance to regain their defensive shape. Instead a simple quick pass turns into a high leverage shot attempt. Looking at where Gerso strikes the ball this is obviously a great spot. But the model can’t see the mishandling of the ball by Gerso. Which is an important part of this because it changes the difficulty of the play for the keeper. Instead of a shot taken either in stride with the goal mouth exposed at each side, you have a small sliver of a goal mouth to poke it into. The lack of control of the ball forces Gerso to make a rather haphazard attempt which greatly reduces the likelihood of the opportunity. I was rather shocked to see this shot classified as open play and it’s a good opportunity to talk about the differences between the run of play and set pieces. This series as defined by the data starts on a set play, specifically a corner, but after being momentarily cleared out it changes the context of the play. We could argue as to what constitutes the changing of a set play into open play, but this isn’t about quibbling over when that specific change occurs. Instead, it’s important to discuss why we differentiate between the two. On the set play you have both attackers and defensive players stacked up in areas of the pitch where you want them. And either you’ll see a team man-mark, as is the case here, or, such as in the case for some teams at the World Cup, you’ll see them take ownership of space. The point is there is a very specific and detailed game plan for this exact moment. By and large defenses have the advantage on set pieces (that aren't direct shots). They tactically have more player's at their disposal to prevent the play than the attack in creating it. This is frequently because most teams leave two defenders plus the kicker behind the ball in case of a counter. But as soon as that ball is cleared out a transition occurs, you have Minnesota players starting to gravitate towards getting forward and it becomes a scramble with more space in the box. Johan Bloomberg makes a nice effort to keep the ball in the box and knocks it back in the general direction of Jack McBean. The ball happens to fall to him off a defender where he can take a touch and direct a shot at goal. The attempt isn’t great as there are a couple of defenders in addition to the keeper which cut down the amount of goalmouth available. But McBean makes a nice turn towards daylight and just misses the attempt. It’s a valiant go and the size of the hole that McBean had to kick it into was no bigger than a womp rat but it just misses it’s mark. This whole sequence is actually really impressive from Portland, but it also kind of underpins how important the Eric Remedi signing is to Atlanta. 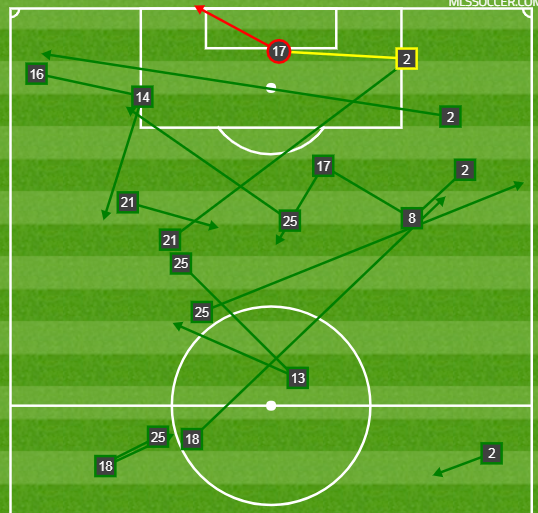 I enjoy me some Jeff Larentowicz, as I think we all do, but the guy doesn’t have the range (or stamina) to chase down a lot of these passes that Portland pinged through the middle at will. Portland’s ability to open up defenses and then move into space here is really good and kind of scary. I specifically like how Jeremy Ebobisse recognizes the play developing (not once but twice) and moves towards goal. The pass by Alvas Powell is solid and Ebobisse makes a nice cut inside to direct the shot on goal, but the overall difficulty of how the chance is created on this play lowers the probability and the shot goes wide. That said, it’s encouraging to see from Ebobisse who is someone I’ve grown fond of over the last 18 months. Another set piece that gets cleared out and turns into a run of play opportunity. Overall the Sounders defense does a pretty okay job in the first couple of opportunities, but their failure to get the ball out of the defensive third and either maintain possession or clear it out to retake their defensive shape is what eventually hurts them. Props to Chicago and the amount of movement that is made on this play. 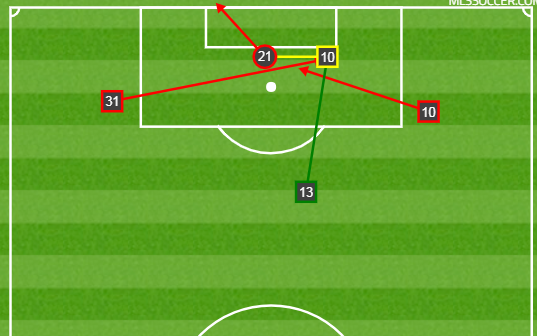 First a nice overlap by Jorge Corrales after the cleared set piece attempt gives Bastian Schweinsteiger plenty of time and space, as Cristian Roldan was stuck in no man’s land in a 2-v-1 situation. I’m a bit surprised that Schweinsteiger goes into the box rather than just making a shot attempt, but with Alan Gordon there it’s not hard to see what he was thinking. The next great piece of movement is by Aleksandar Katai, who is slipped through by way of Brandt Bronico with an excellent pass between the two defenders. His timing to wait and hold the ball just long enough for that window to develop and then make the pass is actually impressive especially in extra time in a frantic moment. The shot from Gordon just goes wide and that happens when you’re shooting for a really tough angle on the goal. He sticks a quick foot on it to redirect it on frame and while we see it happen a lot, we don’t always recognize how tough it is in traffic and the model probably over rates the attempt a bit. This play combination is a nice equal parts receipe of equal parts style and poor decision making by the defense. Fast forward to the 8:31 mark when Jorge Corrales delivers in that hard pass to Aleksandar Katai and then the redirection to Brandt Bronico who starts to head towards goal. 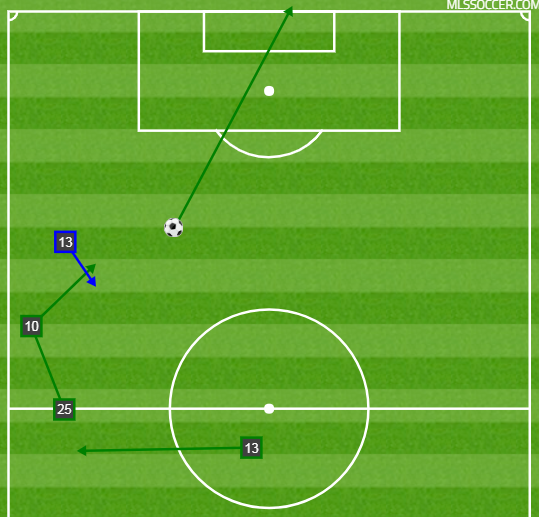 This is a nice little sequence but the critical moment is when Nicolas Lodeiro vacates the middle to chase Bronico. Roldan and Kim Kee-Hee have him trapped and he has limited space available to him, but Lodeiro makes a bad first read and the quick heel kick back to Katai puts him in space. It looks like Kee Hee or Osvaldo Alonso are going to get to him, but Katai freezes them both just for a fraction of a second with a shot fake. It allows him one more step and into the spot he wants to take the shot. This still isn’t a very good shot and you can see that Katai was just trying to make something happen but in that is where the value lies. The shot itself is a pretty low leverage, and the only thing the model can’t really see is he has some space to put a bit of velocity and movement on it, but Frei realistically should have at least parried the attempt.